About this time last year I had been down and out with a horrible flu for several days. I never really ask for help or dinners...but when a friend showed up out of the blue with a warm and comforting meal for my family it made a huge impact on me. One, because I am a huge push-over for a homemade meal and two, because it was an unsolicited gesture of good-will...towards me. I've spoken of Lisa often on the blog (yup she's the Lisa from evil tarts...), as we've gone through some of the same trials, experiences, and personal victories. I've seen her battle through some personal demons...and she's cheered me on when others have totally shunned me (for whatever reason). Just saying...I'm thankful for Lisa's true heart and friendship. That's what this meal is about today. It is a warm and comforting reminder to me that no matter what, I have a recipe and a meal to remind me of friendships that are warm during the "winters" of my life. I hope you have friends like that. I feel blessed that I do. Today, out on the farm (Our Farm Adventures! ), we have some great chard and greens coming into season. Arizona is awesome for this! We've also had some killer beautiful spinach. I've also been messing around with my favorite white beans of all time. Again. Still. Forever. They just aren't leaving my kitchen. Ever. 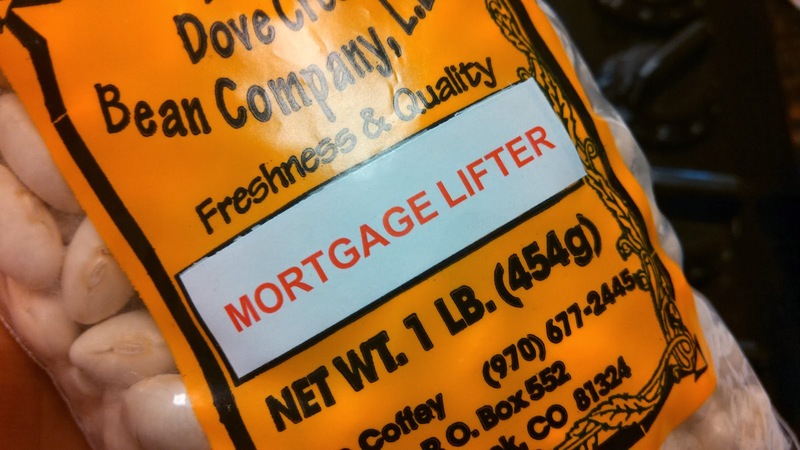 They are called "Mortgage Lifters". Thank you Dove Creek Bean Company. I love you. They are available here locally at our Honeyville store in :Chandler, Arizona. By the way, those who are out of town, La Paloma does not have a website. You can order directly from the owner, Mike Coffey, 970-677-2445, PO Box 552, Dove Creek CO, 81324. They grow 10 different varieties of heirloom and antique beans. All of them are amazing! ...when they're cooked they are the size of my thumb. They taste like a giant navy bean. Awesome for this recipe. Just awesome. Directions: In a 12 inch deep skillet, cook the sausage until cooked through. Add the garlic and onions. Saute until the onions and garlic are clear, and lightly caramelized, about 4 minutes. Add the remaining ingredients. Cook covered 10 minutes until greens are tender. Season generously with salt and fresh cracked red pepper to taste. 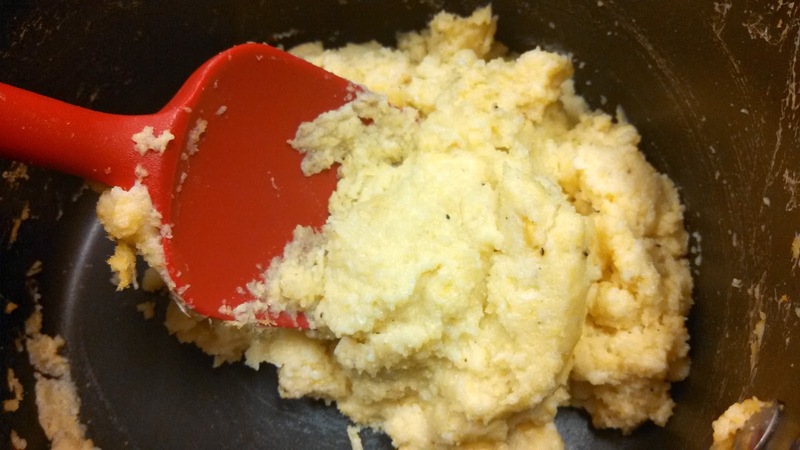 I serve them over this cornmeal mush. I love it instead of mashed potatoes...and it is perfect for this crazy cold winter. Directions: In a small bowl, combine the cornmeal and cold tap water. Meanwhile, in a 2 quart pan, combine the corn, salt, sugar, butter, and hot water. Bring it to a boil over high heat. While the water is heating, add the cornmeal mixed with the cold water. Combining the cornmeal with cool water before adding it to the boiling water keeps the cornmeal from lumping up when it hits the hot water. When the water and cornmeal boil, reduce the heat to low. Allow the mush to simmer for about 10 minutes, or until it is nicely thickened. 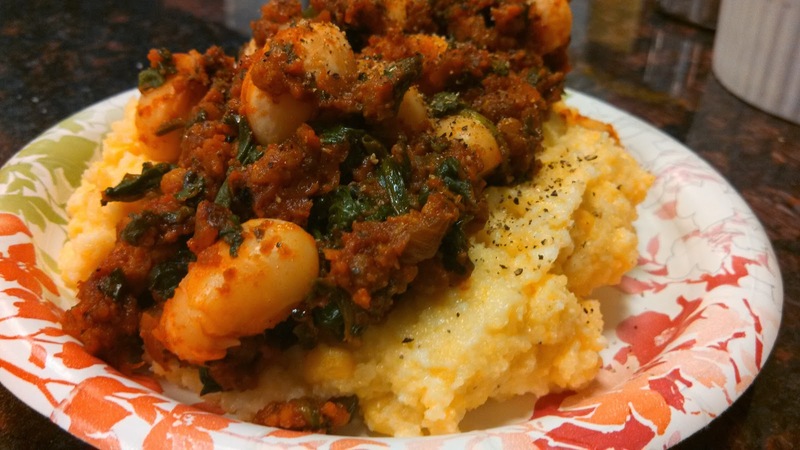 Serve a portion of the cornmeal mush topped with some of the Beans and Greens. Top with shredded Parmesan cheese if desired. 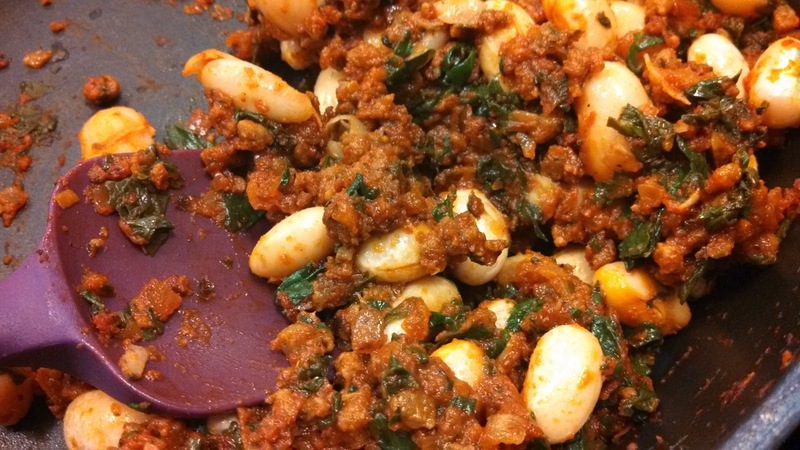 We served this dish in our bean class today and it was well received by all! That's a good sign darlings! There you go! Have an amazing day. Think warm thoughts. Cook something comforting. Life's winter will not last forever. Love and friendship...well, if they are true...will never end. I have ordered a few small items from Honeyville but would love to try more however the packaging is too large. I wish they had sample/and or smaller sizes of things to try. I have ordered small things from Honeyville in the past and would love to order more but the packaging sizes are just too large. Wish they had sample/and or smaller sizes to try different things to see if they work into my cooking regime. Can't find what I posted yesterday, so I will try again. Any chance in the world that I could pay you to make me up a half dozen jars of different soups, etc? The Honeywell products all come in such huge portion sizes that if I don't like the end result I am out a lot of money which is not good!